Some of the rules in table tennis are very complex, particularly the service rules. So let's answer some common questions about the serve. 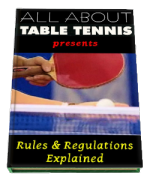 I've discussed the service rules here, but as they're probably the most controversial of all the table tennis rules, it's no surprise that the questions I'm asked the most, relate to the service rules. So let's take a look at a few of these rules and I'll answer some of the most frequently asked questions. 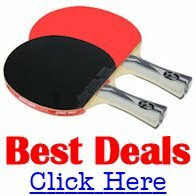 If you have a table tennis question which has not already been asked and answered, you can submit it here. Here are some of the most frequently asked questions about the service rules in table tennis ... with the answers! Can my serve bounce more than once on my opponent's side of the table? As long as your service bounces once on your side of the table, and at least once on your opponent's side of the table, it will be legal (assuming you have complied with the other service rules which I explained here). Of course ... although your service can bounce more than once on your opponent's side of the table, if it does, you win the point because your opponent must hit it before it bounces twice. This means that you can choose whether to serve "short" or "long". A good tactic would be to serve "short" (i.e. make the ball bounce just over the net) if your opponent is standing away from the table, or serve "long" (i.e. make the ball bounce near to the white end line) if your opponent is standing close to the table and expecting a "short" serve. In addition, the ideal "short" serve is to make your opponent think that the ball will travel beyond their end line after the first bounce on their side; whilst actually bouncing twice (or more) on their side. Can my serve go off the side of the table on my opponent's side? As long as your service bounces once on your side of the table, and at least once on your opponent's side of the table, it can then go off the side of the table. If you are playing doubles. In doubles you can only serve to the right half of the table, so obviously your serve cannot go off the left hand side of the table. Can I serve from anywhere? From the start of your service action, and until you hit the ball, the ball must always be above the level of the playing surface and behind your end line (or an imaginary extension of it). So even though you are not restricted as to where you can stand to serve (for example by the side of the table), the ball must always be behind the white end line or an imaginary extension of it in both directions. So this effectively means that you'll need to stand behind the white line at your end of the table to serve. What happens if my serve hits the net? 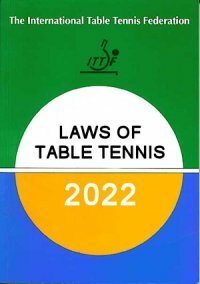 Law (Rule) 2.09 says that if the ball hits the net, but still hits your opponent's side of the table or he obstructs/volleys it before it hits the table, it will be a "let". NB. A player obstructs the ball if he, or anything he wears or carries, touches it in play when it is above or travelling towards the playing surface, not having touched his court since last being struck by his opponent. No point will be scored and your serve must be replayed (assuming you have complied with the other service rules in table tennis which I explained here). It does not matter how many times the ball hits the net, the service is replayed until such time as it is a legal or foul service. What happens in doubles if my serve hits the net and is deflected into the left hand court? Is it a "let"? No. You lose the point. A serve will only be a "let" if it's good in all respects apart from touching the net ... or if your opponent obstructs/volleys it after it touches the net. When playing doubles and serving down the middle of the table, does the base point of the ball have to hit the white line or can any part of the ball be above the line and still be 'in'? The rules say that the ball must touch the right half court - and that the centre line is regarded as part of each right court. So the base point of the ball needs to actually make contact with the line or the right half court to be 'in'. When playing doubles without an umpire and the ball is served close to the middle line, who decides whether it is 'in' or 'out'? At lower levels of play, we must all use the "honour system". So when there is no umpire we have to agree amongst ourselves how to interpret and implement the rules. In my experience, the receiver is usually the first person to call the ball 'out', but both pairs need to agree on the call. If both pairs cannot agree whether a serve landed in the right court or not, the service/point is usually re-played. There is no 'rule' about who decides if it is 'in' or 'out' when there is no umpire - it's decided by consensus between the players. The same applies to every other call during a match. If there is no umpire, everything has to be decided by consensus between the players. What happens when a player serves illegally, but there is no qualified umpire to call it a fault? Unless a match has a qualified umpire, there is not a lot you can do. If there is no qualified umpire, all matches are played under the "honour system" - which means that the people involved have to agree amongst themselves how to play and umpire the games. Qualified umpires are instructed to warn the player without awarding a point only where s/he suspects, but is not sure, that a player's service action is illegal. Only one warning may be given and if any subsequent services are illegal or doubtful, a point must be awarded to the opponent. But for non-qualified umpires, one option would be to call a let, and replay the point. However, if there is a dispute, it all comes down to reaching a consensus between the players. This is a very common problem in local leagues and there is no easy solution. The best solution is to have a qualified umpire for every match. Can I serve on game/match point? I am often asked whether you can serve when you have game or match point, or whether you can only win the game or match when your opponent is serving. The rules in table tennis are the same at game and match point as they are at any other time. The rules state that you have two serves, and then your opponent has two serves (except at 10-10, when you serve alternately). So if you happen to be serving at game/match point ... all the better! In addition, if you foul serve at any time you lose the point. You do not get a "second chance" at game or match point (or at any other time). By the way ... if you played table tennis prior to 2001, you'll probably know that each player used to have five serves each and that games used to be up to 21 points.